I don’t know about you, but whenever I see a gun magazine with yet another custom M1911 on the cover, I just want to retch. I’m not a 1911 fan, never have been. My first auto-pistol was a Tanfoglio CZ-75 clone, and I remain a loyal and satisfied fan of that classic double-action autopistol design. But that’s a picture of a 1911 over to the right – so what’s the deal? Several years ago I got bit big time by the Russian rifle bug after seeing “Enemy at the Gates”, a great movie about famed WW2 Russian sniper Vasilli Zaitsev. Since then, “Saving Private Ryan” and the HBO miniseries, “Band of Brothers” kindled an interest in American WW2 related gear. However, I’m less interested in authenticity, than I am in spirit. Let me explain. When it came time to get myself a Garand, rather than seeking a genuine WW2 specimen, I wanted a rifle that I would enjoy owning and shooting, and last but not least, that would shoot well. As is well known, Garands from the CMP (or anywhere else for that matter) have been rebuilt and rebuilt many times through the years, so a Garand with a war era receiver likely has few other original parts on it. You can get one that has been “corrected” by a collector, but you’ll pay a king’s ransom for it. But then what makes a collector-corrected assembly any more authentic than a cheap CMP mixmaster? Nothing! Though “correct”, it is actually less authentic than a mutt that came straight from CMP. So I chose a Service Grade CMP rifle, a Harrington & Richardson that was made in 1955. As a Garand, it still has that link back to the Band of Brothers. But as a Service Grade, I’m pretty much guaranteed that it will shoot well. As a late model rifle, it will have all the latest upgrades and bug fixes. Plus I won’t mind shooting it as much as I want, because there’s no fear about wearing out a collectable. I recently got myself a Jeep. No, it’s not an original WW2 Willys MB or a Ford GPW. But it is dark green. It’s a 1998 Wrangler TJ with a lift kit and big tires. But now this civilian Sahara model Chrysler product proudly wears a big white star on the hood! Okay, so I’m a nut. Anyways, there is still that tenuous connection back to Saving Private Ryan without any of the real world hassles of living with an original restored WW2 Jeep. All the smiles without the pain. Which brings me around to the Springfield Armory M1911 in the picture above. My WW2 bug just had to lead eventually to the acquisition of a GI-type M1911. Original specimens from the Great War are available, especially to someone like me with a Curio & Relics Federal Firearms License. I could just scour AuctionArms or Gunbroker.com on the internet until I found one to my liking. Then I could place my bid for anywhere from $1500 to $2000 (or more!) and have it delivered to my house. But then, would I want to shoot it? Even more, if I did choose to shoot such a specimen, would it be a good shooter? The answer to both questions would most likely be “no”. That’s what led me to look at the many fine offerings on today’s market of modern-made GI-style .45’s. The really good news about that is that the GI-type 1911 is everyone’s basic (read “cheapest”) offering in their M1911 line. That’s fine with me, because that’s all I was looking for in a 1911. I have no interest whatsoever in the latest and greatest super-tricked and -slicked competition pistols. 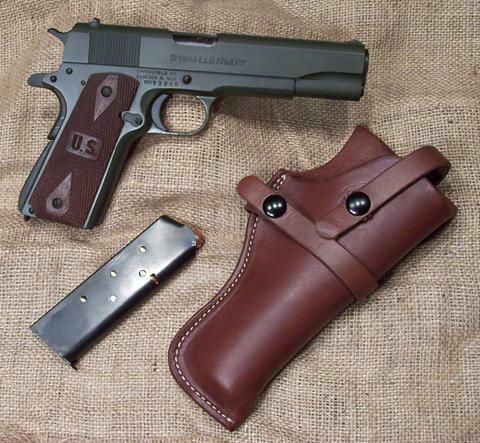 To my eyes, the Springfield Armory GI .45 1911-A1 was the best example of the type of pistol I was looking for. Though not authentic, the Springfield’s walnut wood grips engraved with “U.S.” are what really made the sale for me. This pistol though, is not made in the U.S. It’s made in Brazil by IMBEL. These guns do have a great reputation for being tight, reliable, quality guns, yet at a terrific price. The holster pictured with the GI .45 came from Sportsman’s Guide. It’s their Guide Gear Field Holster and it cost only 20 bucks. The Springfield ships with a small plastic belt slide holster that works darn well, except that it leaves most of the gun exposed to getting knocked around by the environment. The Guide Gear holster protects the gun very well, though it’s not a quick draw. But the leather holster matches the spirit of the period much better, don’t you think? Anyways, so by now you’ve got the basic picture that when I’ve “got the jones” for some historic militaria, I don’t really need the real thing, just something close enough to evoke the connection to the past. With this 1911, the lack of authenticity goes even further. I don’t know if it shows up very well in the photo, but my new 1911 is not blued – it is not parkerized – it is olive drab green! This 1911 wears one of the modern color wonder finishes. The slide and the frame are completely OD green. All the rest of the smaller detail pieces are matte black. I really like the way the small black parts and the brown wood grips set off against the military green color. Once I knew about the green .45, the standard black one simply would not do. The problem was that nobody had one. When I asked at a local store, I was told that all the Springfield GI .45s were in a shortage situation for two reasons: high demand, and high steel prices. Oh, they did have one black GI .45 under the counter, but when I asked whether they could order me a green one, I was told that they could put it on order, but that they really did not expect to be able to get one in for a couple of months! Then a wisecracking associate of the guy I was talking to, offered to take the one they had out back for a quick coat of paint! Yeah, real funny. This story isn’t really about the Springfield GI .45. It’s really all about “Getting Exactly What You Want”. Guns today are made in such a dazzling variety of options, sometimes it can be difficult to locate one with exactly the option set you are looking for. Most of the time, your local dealer can order-in what you want from his distributor, but not always. So what can you do in such a situation? Since getting my C&R FFL license, I’ve gotten pretty comfortable buying guns over the internet. However, my FFL limits me to being able to purchase only guns that have been declared as Curios or Relics by the ATF. Even though the Springfield GI .45 is styled as a WW2 gun, it’s really a modern gun and therefore I cannot use my FFL to buy one. Just like a regular guy, when it comes to modern guns, I still have to go fill out a yellow form 4473 at a dealer’s counter. Nevertheless, I can still buy a modern gun over the internet, and so can you. I hopped on to the internet gun auction site, AuctionArms.com. I typed into the search box, “Springfield GI 45”. Lo and behold, one of the auctions that popped up as a result, was the exact gun I was looking for -- the OD green, five inch Springfield GI 45. The technique I like to use on these online auctions is to take note of the closing date and time of the auction, then make sure I’m sitting in front of the computer screen 5 minutes before the auction ends. Then at the last possible moment, I place my bid. The idea behind this strategy is that you don’t signal your interest in the auction beforehand to other bidders, or to the seller. Yes, there are unscrupulous people selling on these auction sites who will enter a bid against you under another name, just to jack up the final bid price. As it turns out, I was the only bidder and I “won” the auction. Of course the only thing I “won” was the right to pay the guy to get the gun. The seller was in South Carolina. Okay, so now what? Since you and I cannot receive modern firearms in interstate commerce, we need a regular “01 FFL”, a dealer, to receive the firearm for us. Beforehand, I had checked with Sportsman’s Warehouse about receiving firearms. They charge a very reasonable $25 fee for this service. So after the auction ended, I corresponded with the seller about payment and shipping. I then sent him a cashier’s check from my credit union for the auction price of the firearm plus shipping charges. Then I went to Sportsman’s Warehouse with a printout detailing the firearm, my name and address, and the seller’s name and address. Sportsman’s Warehouse then immediately took care of faxing a copy of their FFL license to the seller. I had an email from the seller waiting for me when I got home that evening informing me that the fax was received, and that now he was just waiting for my payment to arrive in the U.S. Mail. Granted, this is a more complex transaction than simply going down to the local gun shop, slapping your green down on the counter and leaving with your new gun. But all went smoothly, because all three parties involved knew exactly what the steps were as required by federal law. In a few days, I got another email from the seller saying that he had my check and that he was shipping the gun. He gave me a tracking number so that I knew exactly when it arrived at Sportsman’s Warehouse. At the store, I filled out the yellow form, paid them their $25, and I was on my way with exactly the gun that no one else in town could get their hands on! Another situation where I’ve done this is when I wanted a rifle in a particular caliber that was offered by the manufacturer last year, but not this year. These rifles were all gone from the distributor pipeline, but I found an individual dealer in Pennsylvania with some of last year’s stock. So maybe if you find yourself in this kind of a situation in the future, you too might think about trying to find the gun of your dreams on the internet.